Asking your customers for Google reviews is another excellent step to help your rankings in Google’s search engine results… as well as encourage prospects to buy from you. If you have received great comments from customers, why not ask them to leave the review on Google? It may be that you need to email customers a link to leave a Google review. And/or set up a reviews link on your website, email newsletter and regular email footer. 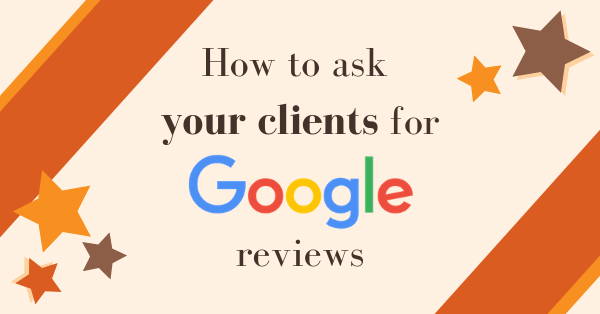 This blog will explain how you can create that link and best advise clients on how to leave your business a Google review. Don’t have a Google Page for your business yet? Here’s our blog with lots more information about Google My Business and why it is important. Let us know if you need help with setting up Google My Business for your organisation and help with all aspects of SEO. Now back to client Google reviews…. To leave a Google review, your customer needs to have a Google account – that means one of the following types of Google account: Gmail, YouTube, Google Play, Google Drive etc. If your customer has one of these, they can easily leave a review. If they don’t have any type of Google account they will need to create one before being able to leave a review. This could put some people off, but most people need a Google account in the end… or you can always ask them to leave a review on LinkedIn, Facebook, Trip Advisor, Checkatrade or other relevant review site instead perhaps! This is a quick and easy process (typically!) – simply create a link and send it to your customers so they can leave a review for your business. You can see an example of how this works by clicking on this link for Pearce Marketing (there is a slight delay for the pop up review box to appear in the middle of the screen on PC/laptop). Follow the instructions below to get the equivalent link for your business. You will need to create this link on a mobile device, using the Google Chrome app, in order for it to work across multiple devices (desktop and mobile). However, if you do not have a mobile device with Google Chrome as your web browser you will need to follow a different set of instructions, see below. Or to make life easier, just download the Google Chrome app on your phone! on the search results page, scroll down to the Google entry showing all of your company information (eg links to call, your directions and website). Click on the ‘reviews’ tab between ‘overview’ and ‘about’. you need to copy the link for this page and give it to your clients. Find the link by tapping the grey box at the top of your screen, the link will then appear. Press and hold on the link and the following options will appear ‘Select’, ‘Select All’, ‘Paste’ and ‘Paste and Go’, choose ‘Select All’. New options will appear ‘Cut’, ‘Copy’, ‘Paste’ and ‘Paste and Go’, choose Copy. This link is now ‘copied’ for you to paste in your emails to clients etc. And that’s it. Send this link to your customers with an intro and a big thank you! on the results page, scroll down to the Google entry showing all of your company information (eg links to call, your directions and website). Click on the ‘reviews’ tab between ‘overview’ and ‘about’. on the reviews page, scroll down until you can see the five grey stars. Click on the stars to give a score out of 5. This will take you to a new page called ‘rate and review’. This is where your clients can type in a review. your company profile (photos, name, address etc.) on the right hand side of the screen with a ‘write a review’ button. or a large map with your name listed below. Click on your company name. On the next screen scroll to see the the ‘write a review’ button. a box will pop up where you can give a star rating (click on the stars to give a score out of 5) and type your review underneath. You can also add photos. When you are done, click the ‘POST’ button. Don’t forget to always respond to reviews – good and ‘constructive’! Let us know how you get on… you can read lots more useful information about marketing, networking and social media on our blog (check out the topic categories in the right hand column). Do contact us if you have any questions – we’re happy to help. You are welcome! Hope it was helpful. Really fantastic tips. now it’s even easier to have clients complete a review. Many many thanks for sharing with us. Hi Nik, that’s great glad we could help! You are very welcome – thanks for you comments! Its my pleasure to visit this post. Its an awesome article, that you have done perfectly about Google reviews. Its most helpful information for me. Thanks for sharing this kind of good article. Hello! Really glad that you found it useful and helpful! Hi Susan, thank you for your kind words – glad that we could help! Hello! Thank you for taking the time to read our blog – glad we could help with some useful information! Many thanks for your comment – so glad the blog post helped you! Thanks so much for your comment – so glad our blog was useful for you.